We’re only human. People stumble and pause with Uhs…Umms…Ya Knows in public speaking. Here are 7 Tips, that I offer as a speechwriter and speech coach, to reduce these all too human “transition stops” in public speaking. Technically called GLOTTAL FILLERs, these are pauses lodged in our upper vocal tract, resonating in the vocal folds of our glottis, near the larynx. Awareness: First, own up. Many people never admit they have this public speaking problem or think it’s no big deal. Au contraire. Overuse can make the speaker look unsure, unprepared or lacking passion. Use Coach or Videotape: Have a colleague, friend or speech coach count your use of glottal fillers in 2-3 speeches, to see if it’s a problem or just an anomaly. Better yet, videotape yourself to see it firsthand. An intense reality check is the second step in changing your behavior. Chunk Content: Third, practice speaking in burst of word chunks…take a PREGNANT PAUSE, then speak in a new burst of word chunks. Repeat. This “content chunking” helps us establish an attractive rhythm to our style. Look over your remarks and place these breaks when in idea group changes. Watch some of the great African-American preachers to see this speaking style. Take it down a notch if it feels too dramatic, but adapt the technique to fit your style. It turns public speaking into oratory. Rule of Three Eye Contact: Fourth, before you begin, select three people with the friendliest eyes –one on the right, middle, and left side of a room. For the rest of your talk, just speak to Mr. Right…Ms. Middle and Mr. Left. Speaking as if you are having a real conversation WITH three people prevents speaking AT an audience. The three folks geographically spread out—will appear as if you are including the WHOLE audience. One less thing to worry on under fire. Anecdotes: Sixth, include great anecdotes—fun or poignant. Telling stories will reduce your transition stops NOT just because they engage an audience. The natural rhythm of good storytelling eliminates the need for glottal fillers. Storytelling gets you in the zone. Work the Room: Lastly, great speakers don’t just hug the podium, they work the stage with purpose. Here’s your new mantra: Walk…Plant…Connect. Repeat. Pre-thinking your movement choices (based on content groups) will lodge in “body memory” making it easier for your brain to recall where to walk automatically. Body Memory helps us engage the Reptilian Brain, the automatic pilot Amygdala part of our brain. Follow these easy 7 Rules and those annoying Uhhs…Umms … Ya Knows will lessen. You will come across as a more confident speaker. I guarantee it. 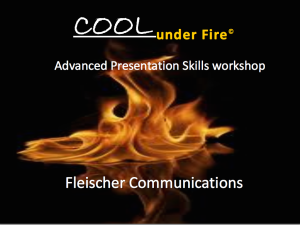 Fleischer Communications offers private Speechwriting & Speech Coaching and the popular “Cool Under Fire” workshops for corporate clients and public workshops.